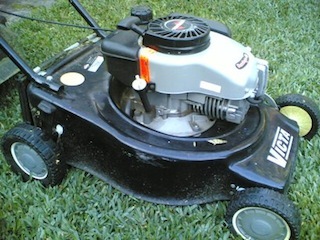 People often consider mowing their lawns at a lower height for many reasons, for some it may be to try and create a smoother finish to their lawns to try and gain that “bowling green” effect, while for others they may be thinking that leaving the lawn for a longer period of time between mowings will reduce their work load by mowing less. To determine whether this may be a good idea for us, let’s take a look through each reasoning for mowing lower and more importantly lets first look at why mowing heights and the length of leaf is so important to lawn health. The green leaf of the lawn is responsible for taking in sunlight to the lawn, and like all other plants this sunlight then converts nutrients from the soil into food for the lawn via the process of Photosynthesis. The longer the green leaf of the grass – the more photosynthesis occurs and the more food the lawn receives to stay healthy. Longer green lawn leaf will mean the grass grows faster. The same is equally true for when grass leaf is cut short – less photosynthesis occurs and as a result the lawn receives less food and in turn grows much slower. If the lawn is kept too short for it’s grass type the sunlight available then it could eventually die altogether. Warm Season grasses such as St. Augustine, Zoysia and Bermuda can be cut shorter under certain conditions, this is when the lawn is in excellent health, is well maintained and when there is ample direct sunlight each day in warmer regions. If the lawn is in direct sunlight for most of the day then the shorter green leaf can is sufficient for ample photosynthesis to occur. However, if the lawn is subject to partial shade then it may not be a good idea to lower mowing heights. Cool Season lawns should generally not be mowed at a lower height as their leaf height is vitally important to produce enough photosynthesis in the cooler regions where they are grown and there is less daylight hours available throughout the year. This is a really bad idea. This is how it works… The grass is left for a longer period of time, the longer the grass becomes the more photosynthesis occurs and the grass start growing even faster. This makes the thatch layer increase in thickness and raises the crowns of the lawn plant. When it’s mowed – all the green leaf is removed which means the lawn suddenly gets next to no food and cannot repair itself, this means very poor lawn health and possibly death for the grass. Even worse is if the crowns of the grass become scalped during mowing, because if the crowns are removed, the affected area will die immediately. Finding the right balance with lawn mowing heights is vital, while we can lower heights slightly during the Summer when light levels are higher, these must return to appropriate higher mowing heights during Spring and Winter. The key is to find and keep the right heights for your lawn type and which is right for your region.